Creeping buttercup is a common weed of gardens, thriving particularly on wet soils. As its name suggests, it’s a real spreader if left unchecked and can form a dense network of shoots, runners and roots. Creeping buttercup (Ranunculus repens) is a perennial weed particularly troublesome in moister soils where it grows strongly and roots deeply. It can be found in lawns, borders and bare soil areas. After mild wet winters and in heavy soils rich in clay, creeping buttercup spreads widely and is difficult to eradicate from amongst permanent plantings in borders and in the fruit garden. This weed’s presence often indicates the need for improvements to soil structure and drainage. The classic glossy-yellow flowers of creeping buttercup (Ranunculus repens) are not unattractive from May to September but the foliage is coarser than meadow buttercup (R. acris) and it tends to stay more low-lying. Flowering may be absent in mown grass. Creeping buttercup does not bear bulbs in the way lesser yellow celandine (R. ficaria) does. Creeping buttercup spreads by means of long runners; strong white, deeply penetrating roots that branch from each leaf node. Sub-lateral runners develop to form a vigorous, firmly anchored network of stems. Reproduction is usually from seeds but in moist conditions small nodal sections of stems may become established if severed and scattered when roots are beginning to form. In spring, before mowing use a wire-toothed rake to lift the developing runners so that they can be cut by the mower. Aerate in autumn to improve drainage. The runners can be dug out in spring with a trowel. Repeated hoeing through the summer will also eliminate this weed. Both processes will need to be repeated several times for full control. 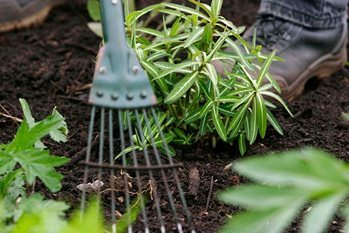 Where very thick infestations occur there may be no option but to lift desirable plants removing any parts of the weeds and hold the cleaned plants in weed-free ground while the infested border is cleaned up over the summer using the methods described for bare soil. Digging and hoeing will destroy this weed. Alternatively, smother it with a sheet of black plastic mulch. These should be left in place all summer. Most lawn weedkillers (e.g. Doff Lawn Weeder or Westland Resolva Lawn Weedkiller Extra) will control creeping buttercup. Apply in spring when growth is vigorous and repeat if necessary. Weedkillers based on glyphosate (e.g. Roundup Fast Acting, SBM Job done General Purpose Weedkiller or Doff Glyphosate Weedkiller) are effective in controlling creeping buttercup. However, as glyphosate is not selective in its action, it is essential to avoid spray or spray drift coming into contact with garden plants. If treating weeds in the immediate vicinity of garden plants, apply carefully using a ready to use spray or the gel formulation (Roundup Gel) in cool, calm weather. Branches or shoots can be held back, using canes, or by covering or screening while spraying, but make sure that the weed foliage has dried before releasing branches or removing the covering. A weedkiller based on glyphosate (see above) will eliminate it very effectively, spraying in spring or summer.